Where dreams of horses come true! 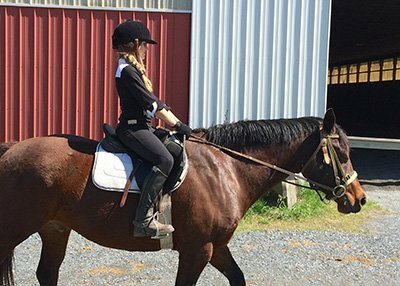 Established in 1932, we offer a specialized day camp program emphasizing horseback riding instruction for all levels of ability. Campers also participate in stablecrafts, recreational swimming, games, vaulting, special events plus much more! Our day camp is for boys and girls, ages 7 –15, with total weekly enrollment of approximately 30-35 campers. Through a program which stresses safety, fun and correct skills, our campers gain a genuine sense of fulfillment, pride, and accomplishment. Waredaca continues its partnership with the Bar-T summer camp organization to offer an outstanding summer experience! The successful blending of the Bar-T camping ‘know how’ with the expert instructional riding staff and facilities that Waredaca is known for, has produced the finest possible opportunity for everyone. Campers benefited from the same quality Waredaca teaching and horses with some added extras. Transportation to and from the Bar-T Laytonsville home base was a welcome option for many or parents can continue to drop off and pick up from Waredaca. The Bar-T’s waterfront equipment occurred daily as was regular use of the adventure activity sites. Gayle (Ford) Mahaney directs the program plus you may likely see a number of familiar staff faces from before! All enrollment and program details will be handled by the Bar-T organization. Go directly to the Bar-T website to enroll. Please check out their website: www.Bar-T.com for more information about Bar-T. For more information about the Summer Riding Program, specifically for details of the riding camp philosophy, fees and programs, visit http://www.bar-t.com/summer/sports-camps/riding-camp. Looking forward to seeing you this summer as a Bar-T camper at Waredaca!